More than 100 years ago when the SS Ancon sailed into the history books as the first ship to transit the Panama Canal, the waterway was a display of American ingenuity and the Panama Canal Zone was firmly in U.S. hands. But the ship making the first official trip through the newly expanded canal on June 26 will be a Chinese megaship. The United States remains the most important user of the canal but world trade patterns have shifted in the past century and China has become the world’s largest trading nation. More than 100 years ago when the SS Ancon sailed into the history books as the first ship to transit the Panama Canal, the waterway was a display of American ingenuity and the Panama Canal Zone was firmly in U.S. hands. The United States remains the most important user of the canal and canal officials say it will be for the foreseeable future, but world trade patterns have shifted in the past century and China has become the world’s largest trading nation. Between 6 a.m. and 7 a.m. on June 26, China COSCO Shipping’s recently renamed 984-foot-long Panama will approach the new Agua Clara locks on the Atlantic side of the 50-mile long canal to begin the first official voyage through the expanded canal. It won the honor in a drawing among the canal’s top customers. Although the new locks — tall as an 11-story building — are an engineering marvel and the expansion is expected to double the canal’s capacity, it’s been a long slog. The project is being delivered nearly two years behind schedule and various claims by the Grupo Unidos por El Canal (Group United for the Canal), the international consortium that built the expansion, could push the price for the project even higher. The Panama Canal Authority also has its own counter-claims. Arbitration on the first unresolved claim gets underway in Miami in July. But now —110-million man hours, 292,000 tons of structural steel, 1.6 million tons of cement and 5 million cubic meters of concrete later —the project is finished. Panamanian voters approved it in a 2006 referendum. “This is a great project from an engineering and logistical point of view,” said Giuseppe Quarta, chief executive of the consortium. The project, which got underway in 2007, included deepening and widening the entrances to the canal, widening and deepening the navigational channel through Gatún Lake, deepening the channel at Culebra Cut, raising the level of the lake, building a new 3.8-mile Pacific access channel, and construction of larger Atlantic and Pacific locks that are as long as three Empire State Buildings laid end to end. The original canal, built at great human and financial cost, is simply too small to handle the bigger ships now plying the world’s trade routes. Smaller ships, however, will continue to use the original locks, and the old and new locks share much of the original canal route. With the expansion able to handle longer, wider and heavier post-Panamax ships, the canal authority hopes to win back shipping lines that switched to the Suez Canal or used U.S. West Coast ports because their ships couldn’t fit through the original locks inaugurated on Aug. 15, 1914. Panama’s President Juan Carlos Varela will preside over a ceremony at the Agua Clara locks celebrating those who worked on the project. Then the Chinese ship will proceed to the 3 p.m. main event on the Pacific side of the canal. At least 10 heads of state as well as port directors and shipping executives from around the world are expected at the Cocoli locks to mark the inaugural passage. The next day, the new locks will open for regular commercial traffic. Already, shipping lines have made more than 120 reservations for the new locks. The timing for delivery of the project hasn’t been great. Not only have low water levels brought on by an El Niño-induced drought in the Panama Canal Watershed hampered shipping operations through the canal this year, but the economic slowdown in China and too many ships chasing too little cargo on many shipping routes worldwide also have taken a toll. But Benítez said the hope is that the canal will not only be able to capture traffic that shifted to the Suez Canal but also pick up about 10 percent of the cargo that now goes directly from Asia to U.S. West Coast ports. Cargo arriving at Long Beach and Los Angeles — the two busiest ports in the United States — is shipped by rail or trucked to the Midwest and East Coast. The West Coast route is faster but it’s cheaper to ship cargo through the canal to East Coast ports. Meanwhile, the delays in completion of the expansion have given U.S. East Coast ports and other ports around the Americas more time to complete dredging and other improvements so that the big ships transiting the canal can enter their shipping channels fully laden. Although a number of ports are at various stages of dredging projects, only Norfolk, Va.; Baltimore and PortMiami are big-ship ready on the East Coast. With its shipping channels now dredged to a depth of 50 to 52 feet, massive super post-Panamax cranes in place, and a new port access tunnel and rail bridge completed, PortMiami hopes to become a first port of call for post-Panamax ships. Now container ships sometimes steam right past Miami and unload cargoes destined for Florida at ports like Savannah that have sophisticated distribution centers. Then the goods are trucked back down the Florida Peninsula to be sold in the Sunshine State. At a minimum, Kuryla would like to get some of that Florida-bound cargo back and enhance Miami’s position as a trans-shipment point for cargo destined for smaller ports in the Caribbean — and perhaps even attract some of the cargo that currently heads to West Coast ports. Kuryla will be on hand in Panama for the inaugural transit. “It’s the event of a lifetime for a port director,” he said. But PortMiami will be having a celebration of its own on July 9 when the first post-Panamax ship that has traveled through the new locks arrives in Miami. By year’s end, Kuryla hopes big ships will be regularly calling in Miami. In Panama, the canal is not only the economic lifeblood of the country that sits between two oceans, but the expansion project has become a huge source of pride for Panamanians. But fees from ships transiting through the canal aren’t Panama’s only source of canal-derived income. Panama has become a thriving trans-shipment point for Latin America-bound cargoes, it is developing a new port on the Atlantic side of the canal and it is in the process of bidding out construction for a new port at Corozal on the Pacific side. “Panama is a natural trans-shipment hub,” said Benítez. In recent years, cargo handled by the Port of Balboa on the Pacific has grown from about 250,000 containers a year to 3.5 million, he said. Although the paint is barely dry on the new locks, the Panama Canal Authority is already studying the possibility of another larger set of locks because ships too big to fit through the new locks are already being built. Panamanians who have worked on the canal feel a sense of accomplishment now that the project is complete. During the peak of construction, there were 30,000 workers laboring around the clock. In the last few weeks, about 2,000 workers have rushed to complete roads, landscape, paint, work on the blue-roofed buildings and finish other last-minute details. The international consortium responsible for the design and construction of the project completed the locks on May 31, and in recent weeks, tests have been run — including putting a rented container ship through its paces at the new Atlantic locks. The consortium includes Spain’s Sacyr Vallhermoso, Italy’s Salini Impregilo, which specializes in water projects; Jan de Nul Group, a Belgium-based dredging company; and CUSA, a Panamanian construction company. On a recent day, Junior Moreno, 30, stood atop a 3,200-ton gate at the new Pacific locks with a walkie-talkie in hand as it began to move. It was his job to ensure safety as the rolling gate glided seamlessly along a track. “I feel quite proud to be a part of this,” he said. He’s regularly taken pictures of the expansion’s progress and explains what is going on to his 11-year-old son, Junior Javier. Plus, he said, working on the project “is one of the best construction jobs in Panama right now.” He said his $1,500 monthly pay is about double what he might earn at another job site. Because of all the training by the consortium, many of the workers have picked up new skills. But there also have been some other dividends for Panama during the expansion project. The excavation has been like a huge archaeological dig. Under a contract with the canal authority, the Smithsonian Tropical Research Institute collected and catalogued 8,862 items. Pre-Colombian arrowheads, colonial artifacts and machinery used during the French era at the canal were unearthed, and fossil and archaeological discoveries, including 21-million-year-old fossilized monkey teeth, have led to a new understanding of the time before the Isthmus of Panama connected North and South America. “The theories of the origin of the isthmus have been revised,” said Benítez. 1881: French begin construction of Panama Canal and start hiring 30,000 West Indians to work on construction. 1889: Ferdinand de Lesseps, the French diplomat directing construction, abandons the project. Some 20,000 people have died, mostly from malaria and yellow fever, during the eight-year endeavor. Another 5,000 would die during the U.S. construction phase. 1902: U.S. Senate votes in favor of Panama, rather than Nicaragua, as site for a canal through Central America. 1903: Panama declares independence from Colombia and the Hay-Bunau-Varilla Treaty is signed granting the U.S. a narrow strip of land across the Isthmus of Panama and the right to build a canal. 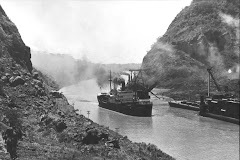 1904: The United States buys canal equipment and infrastructure from the French for $40 million and acquires control of the Panama Canal Zone from Panama for $10 million. The U.S. dollar becomes Panama’s official currency. Construction begins on the canal. Aug. 15, 1914: The 50-mile-long canal opens to ship traffic. SS Ancon is the first ship to traverse the waterway. 1964: A tumultuous year in which anti-U.S. rioting erupts, including the so-called flag riots. Twenty-one Panamanians and three U.S. soldiers are killed in the clashes. 1973-74: Negotiations on a more equitable canal agreement take place under Presidents Richard Nixon and Gerald Ford. 1977: During the Carter administration, negotiations are completed for new canal treaties that call for the eventual turnover of the canal to Panama. 1979: Panama Canal Treaties, which return the Canal Zone but not the canal to Panama, become law. 1989: The United States sends 24,000 troops to oust Panamanian strongman Gen. Manuel Noriega in an operation that has been described as part drug raid, part war. Dec, 31, 1999: The canal is handed over to Panama. Oct. 22, 2006: Panamanians vote for the expansion project. 2009: Contracts awarded for various parts of the expansion. June 26, 2016: The canal expansion is set to officially open.